The caramel syrup delivered, too. It found a nice home in my morning lattes and I was left with an empty bottle rather quickly. The individually-wrapped caramels are buttery, with just the right amount of salt. They melt in your mouth and would have made a NC State Fair caramel apple “Granny-Smith-apple-green” with envy. I wondered what could make this caramel so much better than the other caramels I’ve tasted, so I investigated a bit. I don’t usually pay too much attention to what a company has to say about their own products, because, let’s face it, there’s a wee bit of understandable and expected bias inherent in self-promotion. But, this was different because I was really curious. 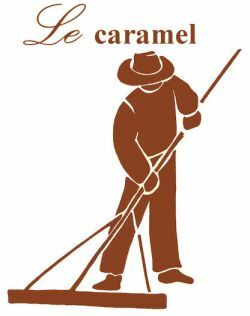 According to Le Caramel, it handcrafts the caramel using a traditional Normandy recipe that was handed down to them by the best caramel makers. The careful preparation results in a remarkably accurate tag-line of “Le Caramel : It’s the way caramel should taste.” Mystery solved, I guess! (No, I kid. There’s actually a bit of information about their process on Le Caramel’s website, if you’re an interested foodie.) Whatever you do, do yourself a favor and get some of this caramel. You won’t be disappointed! OK..now I just have to order some! The BEST chocolate cream ever. Divine on Haagen Dazs vanilla ice cream.